On the United Nation’s World Water Day, 22 March 2011, UNESCO and IUPAC launched the International Year of Chemistry (IYC) Global Experiment: “Water: A Chemical Solution.” The event occurred at Ratanga Junction, Cape Town, from 22–25 March 2011 and was organized in collaboration with the City of Cape Town Municipality. 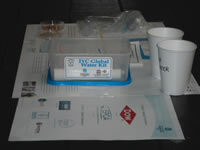 The IYC Global Experiment, entitled “Water: A Chemical Solution,” consists of four component activities: pH measurement, salinity measurement, filtration/disinfection, and desalination. Each can be carried out by children of all ages in schools around the world and no special equipment is needed (all experiments can be done with laboratory equipment at schools). The activities are adaptable to the skills and interests of students of various ages and use equipment that is widely available. The theme for the UN World Water Day 2011 was “Water for Cities: Responding to the Urban Challenge.” During the Big Splash, which coincided with the South African National Water Week, students were exposed to different activities that emphasized the importance of water in their city, Cape Town. Pupils from different schools in Cape Town (areas such as Langa, Khayelitsha, and Hout Bay) were first exposed to the difficulties of obtaining water from a standpipe in Khayelitsha (an informal settlement). This activity taught the students the hardships faced daily by people in informal settlements as well as how they cope. They were then transported to Ratanga Junction where they watched a play, performed by the Jungle Theatre, that dealt with the importance of conserving and preserving local water supplies. Next, the students conducted two of the four experiments for the IYC Global Experiment under the expert supervision of Erica Steenberg from RADMASTE Centre, University of Witswatersrand, and three volunteers. 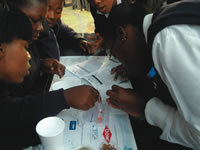 The participating pupils enthusiastically found the pH of a sample of water from Intaka Island (a wetland in Cape Town) and then filtered and purified the water. This was the first chemistry experiment that most of the pupils had ever carried out and their excitement at completing the exercise and obtaining the results was delightful to witness. Their total engagement in the experiment was evident in the many questions that they asked. 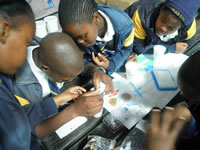 The Department of Science and Technology in South Africa generously donated IYC Global Experiment kits to the schools that attended the Big Splash. 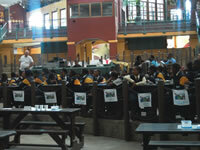 In a brief opening ceremony on 22 March 2011, presided over by UNESCO, the Deputy Minister of Science and Technology, Derek Hanekom, presented the schools with their kits for the IYC Global Experiment. 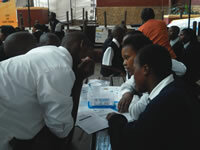 Sasol also sponsored the event and provided the students with caps. A short film of the activities has been posted on YouTube <www.youtube.com/watch?v=r4gS9bep8Tc>. Rovani Sigamoney <r.sigamoney@unesco.org> is the IYC Focal Point at UNESCO. Page last modified 6 May 2011.